Analyze This was the Grand Champion Simmental bull at the 2008 Nebraska State Fair, and is a full brother to former National Champion, JS Burning Up. 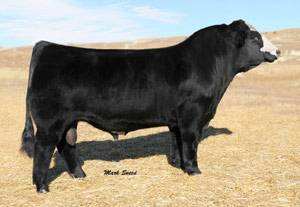 Analyze This is Homozygous Polled and Homozygous black. He's big topped, ultra sound, and huge butted . Analyze This will work great on Angus females for making half bloods. Dam is the famous donor, Triple C Burning Power.